The vision of the Ushers Ministry is to greet everyone with a warm smile and to serve spiritually, devoutly and willingly as doorkeepers to God’s house. Our mission is to greet and embrace God’s people as they enter into His sanctuary and to welcome them with a spirit of love and kindness. 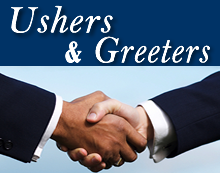 If you are interested in joining the Usher and/or Greeter’s Ministries, please contact any Usher.